Cape Town. We at JC Heat 2 Tile, supply heating elements and thermostats needed for floor heating. It is used for under tile, under carpet, under wood, screed and most floor surfaces. We are situated at 23 Heron St, D`urbanvale, Cape Town. Our heating elements and range of energy saving thermostats are distributed from Johannesburg to Cape Town, also nationwide. The rest of materials needed for DIY can be bought at any hardware store, ie. hessian, bonding liquid and self leveling screed. At JC Heat 2 Tile, the range of thermostats consists of Analogue, Digital, Programmable and High Tech Motion Sensors. In addition, these can be surface mounted or flush mounted. Flush mounted are made to fit onto 4 x 2 box or 4 x 4 box. Surface mounted thermostats, boxes are not required due to a plug being connected. These heating systems are very versatile, is used for various farming methods, ie. crocodile farming, chicken farming, nurseries or any environment that needs to be temperature controlled. Why is Under Floor Heating the best form of heating ? Why is Under Floor Heating the best form of heating? How effective are conventional heaters? Conventional electric or gas heaters does not distribute heat evenly. These kind of heaters create cold and hot spots in the room. From where your heater is positioned, heat would rise up directly. So, in essence, the heat would rise straight up from the source. This would result in heat accumulating in the roof, causing hot and cold spots. The heat would only be felt when you are close to the heater. It’s similar to standing around a fire, you only feel the heat when you are close to the fire. These types of heaters also dries the air, so not suitable for allergy, asthma sufferers and those who suffer headaches. The benefits of underfloor heating. Under floor heating is the best form of heating because it is installed underneath the floor surface, covering 60% of the floor surface, resulting in heat rising uniformly. 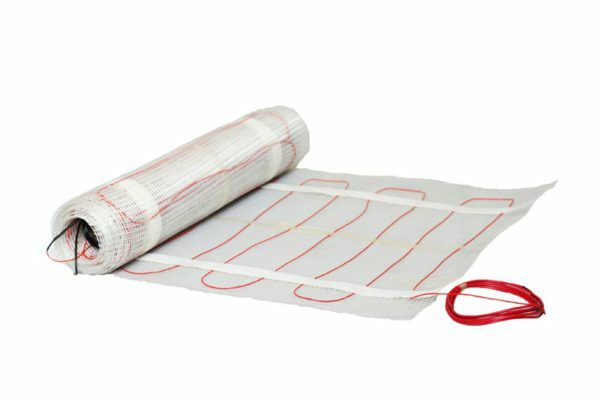 Underfloor heating is a durable heating system that heats your home effectively and efficiently with no maintenance required. A uniform heat rises resulting in the entire room heating up. There will be no hot or cold spots. Ensure that the rooms are well insulated to maintain efficient running costs. Installing a modern energy saving thermostat also helps with consumption and managing your under floor heating. The heating system is laid directly beneath your floor surface so there are no exposed wires making it the safest way to heat your home. The heating system is controlled via a thermostat ( analogue, digital or programmable ), so you can choose the most comfortable temperature for you. Underfloor heating can be installed under any floor surface. The most durable being tiles as it is a better conductor of heat. This heating system is suitable for carpets, laminate floors, engineered wood, marble and tiles. Mesh Mats Underfloor Heating Guide. How to install underfloor heating. Installing underfloor heating yourself is a rather simple process. If you the handyman type, following the steps listed below should be easy and fun to follow; so…how to install underfloor heating ? Step 1: Make sure the size mat you purchased is the correct size for your room. Now you need to plan the layout of the mat. Start doing this by doing a sketch of the room with all measurements of mat. Also, know where you would be positioning your thermostat, as this would the starting and end point of the mat. Step 2: Once step 1 is done, make sure the floor surface is clean and level. If there are any rough patches, level it out with self leveling screed. Step 3: Now, from the point where you would place your thermostat, roll out the mat to the desired length, then cut the mesh to twist mat to run parallel next to rolled out length, be careful not to cut the wire. You may cut away some mesh if you have excess, this could happen when installing in bathrooms. Continue in this fashion until the desired floor space is covered, ending back at starting point. Step 4: To hold the mat in place, use strong duct tape, hot glue gun or nails attached to mesh, NOT the wire. Step 5: If you are installing an external sensor ( would be used for bathrooms, cemcrete floors and wooden floors ), this should be perfectly positioned in the middle of the heating wires. If you position it closer to one cable than the other, the temperature would not be gauged properly. Step 6: If you had purchased an alarm ( ideally you should ), connect the cold tails ( this is the wire at end of mat which connects to the thermostat ), to the alarm to ensure the mat did not get damaged. If the alarm sounds, you have a problem. Step 7: .To lay your tiles or floor surface: There are 2 methods, its up to your own initiative. Method 1: You can lay tiles directly on top of mat ensuring the tile adhesive goes through the mesh to make contact with concrete floor. Method 2: Prepare a slurry mixture of self leveling screed and bonding liquid. Spread this mixture over the mat and leave it to dry. This mixture will get rock hard. You can now install the floor surface of your choice. Step 8. Assuming the alarm hasn’t sounded, floor surface been laid, you can now connect the thermostat to the heating system. In our next blog we will explain how to connect and position various models of thermostats. Step 9. Let it dry for a few days before first usage. If you found this guide to be useful and user friendly? Then don’t forget to like us!!! Underfloor heating at J C Heat 2 Tile specializes at providing heating under any type of floor surface. Under tiles/porcelain, carpets, wood, screed and any natural stone,slate or marble in South Africa. 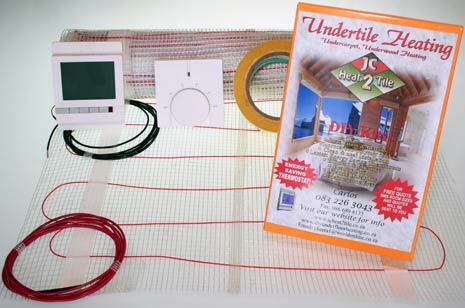 We also supply D I Y under tiles heating units and floor heating thermostats. The thermostats range from analogue to digital to programmable. Our underfloor heating system poses no harm or damage to any floor surface nor to your budget, health or environment. the BEST durable investment you can make / add to your property and lifestyle. Installation is no more than 1 – 2mm thick under your floors. Heat is distributed evenly throughout your room/s which is regulated by the sensory thermostat that you have preset for your comfort.The lifespan durability of the underfloor heating system lasts as long as your floors. When do I start ? As soon as you start planning your new home or renovations in order to include it in your budget. Is it possible to install the underfloor heating under any floor surface?Absolutely, our heaters can be installed under most floor covering including : ceramics, porcelain, travertine, marble, slate, sandstone, screed floors, carpets and laminated wooden floors. How does the thermostat work? Once it has been switched on, the thermostat has a sensor that measures the difference in air temperature. Once you have set the thermostat to your desired comfort level, it will switch on and off automatically to maintain the preset room temperature. Is it safe to install undertile heating in my bathroom? It is completely safe as the heaters are fully earthed as per regulation. How long will the underfloor heating system last? Our heating system has a lifespan durability when installed correctly. How long will it take for the floor to heat up? This depends on the thickness of the floor surface, but normally approximately 15 – 20 min for the floor to feel warm then 10 min more for the room to heat up. Can the underfloor heating be fixed directly on top of existing tiles? Yes, the floor must be completely free from dust, dirt and grease. When installing on top of existing tiled floors this floor needs to be treated. Can underfloor heating be used as the only heat source? Absolutely, upon correct installation, the floor warms up causing heat to rise resulting in the entire room being warmed. Is it advisable to do it myself and is it possible to fix? Is is preferable that you have it professionally installed as it also comes with a guarantee.And yes, we are able to find the exact point of fault to repair. How much will the running cost of my underfloor heating be? Upon correct installation it should operate for approximately 8hrs a day. Eg: room size – 22m2 require 2kw heater. The average price of kw/hr = 1 R. Equals: 2kw x 8hrs x 1 R= R 16 +/- .Of course these calculations are all relative to certain conditions of your home, depending on the insulation and air current flow in your home. Are the installations of the undertile heating system legal? All installations are according to legislation, ensuring the future sale of your home as it will be in compliance with your electrical certificate. Installation or DIY Underfloor Heating ? INSTALLATIONS : Sms or WhatsApp to 083 226 3043 – Email to info@underfloorheating.joburg with wall to wall room sizes for an instant quotation or use submission form at Prices page. DIY : Refer to our SHOP page and follow the prompts, select your products, make payment and delivery will be within 2 to 3 working days.We deliver nationwide.
" I would like to thank you for the speedy and efficient service. Thanks guys, it's very rare these days." " The DIY that you sell was very easy to install. I just follow instruction on your video. " " The quality, price and installation of your product was top range. Will definitely recommend your company."